Come join one of the largest online poker communities! As fans of online poker continue to increase exponentially, get in on the fun with poker at the touch of your hand. The Live Poker 6K app will help you increase your skills and win the jackpot. With over 1.5 million players daily participating at the biggest texas hold’em casino, you are sure to meet new people and if nothing else enjoy some great poker. The popular game on Facebook and MySpace is now available for your iPhone or iPod touch. Even if you only have a few minutes you can jump in and play a hand or two. If you don’t want to risk your whole nest egg just enter one of the many tournaments which requires few chips to enter but can pay out significantly. Just sign in and immediately you will be able to connect and play live with all you Facebook friends. Start with 6,000 free chips and receive 2,000 more chips every day that you play. Variety of different tables to play at so that you can bet as little or as much as you want. 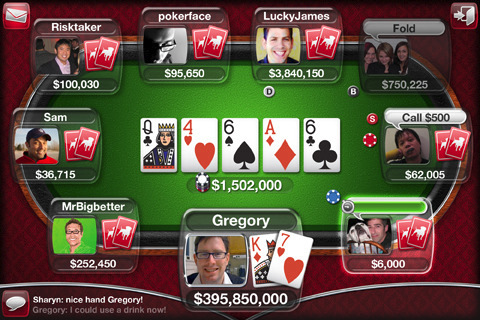 Play live poker with real people either on your 3G network or Wifi. Live Poker 6K is as addictive as any casino you can visit in Las Vegas. All it takes is one good win and you will be hooked. You have the thrill of being able to go “all in” and see if you can take the large pot. If you go broke you can play the cheap tables or just wait a day for your daily 2,000 chips. There will always be new competitors so the replay value is very good. Make sure you have a good connection because if it falters you could lose out on a big win. No two games will be same so there are times when you will be able to easily win thousands and times when perhaps your luck won’t be so good. Come test out your poker skills at the largest social casino on the web!